Are the resulting vcfs available on the 1000g ftp or elsewhere? Thanks. I’d be happy to upload results to S3 to make this easier to build off of. What calls in particular are you interested in? By joint calling do you mean pedigree-driven logic? Honestly I don’t really understand the popularity of joint calling against whatever biased cohort winds up in a run at a particular time. This doesn’t have any pedigree-driven algorithms, and is rather using the other variants in the current cohort to inform calling. I’m agreed that is makes sense to think about designing the population to include family members and others with the same genetic background. This is a step in the right direction towards having a more generalized graph-based approach to the reference genome, since the variants allow you to specifically interrogate haplotypes not necessarily found in the reference. I’m hopeful the realignment approaches, coupled with improved reference genomes, will help with these situations in the short term. Thanks much for the thoughts and discussion. 1. Does this approach work equally well on whole exome data? 2. Have you considered integrating ABRA for assembly-based realignment? You mentioned it on twitter sometime back. 3. Could you please point me to the possible regions to exclude that are considered hard to call? I can’t find the GIAB bed files. Thanks much for the questions. This does work equally well on exome data. We’ve mostly been focusing on whole genome data due to also wanted to tackle the scaling issues involved with that but that doesn’t preclude it from working on targetted examples. We’d like to evaluate ABRA, especially in the context of indel calling in tumor/normal pairings. It is just something we haven’t had time to work on yet. Contributions are definitely welcome. For excluded regions from GiaB, the small script for setting up the validation has the URL and wget command: https://github.com/chapmanb/bcbio-nextgen/blob/master/config/examples/NA12878-trio-wgs-validate-getdata.sh. We also remove low complexity regions (LCRs) and this post has pointers to the BED files for that: https://bcbio.wordpress.com/2014/05/12/wgs-trio-variant-evaluation/. Could you say a bit more about how the final VCF merging step of the generalised approach? In particular, how do you deal with variant annotations such as MQ or QD which need to be aggregated across samples? Thanks much. In general we make use of other tools when possible, so we don’t implement this ourselves. For merging we use GATK’s CombineVariants (https://github.com/chapmanb/bcbio.variation.recall/blob/2478a4a8ead855287cb1b109976f3136bd5db6f1/src/bcbio/variation/recall/merge.clj#L65) so inherit all of the benefits and limitations of their tool. For your specific examples, GATK will drop MQ and QD if they’re present in multiple samples so I wouldn’t use them for downstream filtering since they won’t always be available. If you know of tools that handle this automatically we’d be happy to incorporate them. Thanks again. It would be great to have all vcf.gz files somewhere to download. Ideally the highest scoring ones first, if space is an issue. I believe Illumina BaseSpace allows for vcf uploads (registration required) and sharing. Let me know if you have any questions. Thanks much for following up with these. Hi Brad, thanks for uploading the vcfs. Can you tell me how many lanes were used for the bams in these analysis? Are these from the 4 lane NA12878 Illumina Platinum Genomes runs uploaded to 1000G? Very nice analysis. Can you tell me if Discordant(shared) means true-negative? If it is indeed true negative, how come specificity here is very different from the “minimal bam preparation pipeline” post? Thanks for the question and happy to hear the post is useful. Discordant (shared) variants are positions where they are called as a variant in both the reference standard and evaluation calls, but the calls differ. 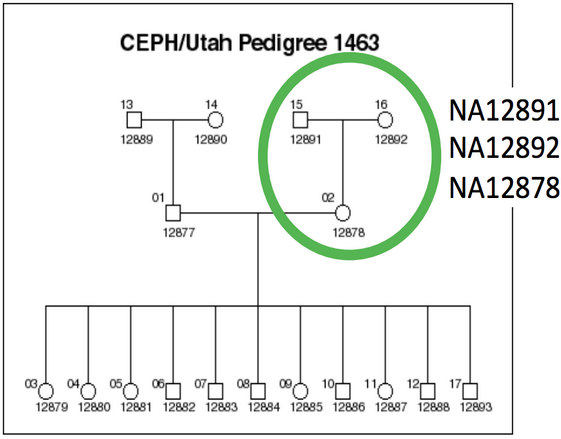 For SNPs, this is generally a heterozygote/homozygote difference and for indels the two calls often overlap but are not the exact bases. The difference in numbers between this and the minimal post is the scale. This is whole genome and the minimal BAM preparation analysis is on exome. We’ve worked a lot on scaling in the meantime and able to run these reasonably fast on whole genomes. Hope this helps. great post as usual. 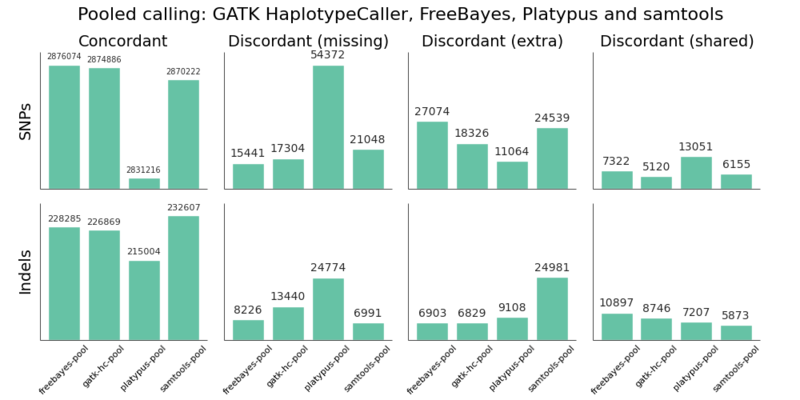 Can you tell me where I might find the exact commands used for Freebayes and GATK in this comparison? Thank you. Glad the post is useful. Are you looking for initial calling commands or the joint recalling steps? For the initial calls, both are in bcbio-nextgen (FreeBayes: https://github.com/chapmanb/bcbio-nextgen/blob/9b3e9e167cc26be203d0731c45ea13e318718567/bcbio/variation/freebayes.py#L121 and GATK: https://github.com/chapmanb/bcbio-nextgen/blob/9b3e9e167cc26be203d0731c45ea13e318718567/bcbio/variation/gatk.py#L71). For joint recalling, those are in bcbio for GATK (https://github.com/chapmanb/bcbio-nextgen/blob/master/bcbio/variation/gatkjoint.py) and in bcbio.variation.recall for FreeBayes (https://github.com/chapmanb/bcbio.variation.recall/blob/48b06869b58eebfb2380ec728605ec18e9bfac0f/src/bcbio/variation/recall/square.clj#L62). Hope this helps. 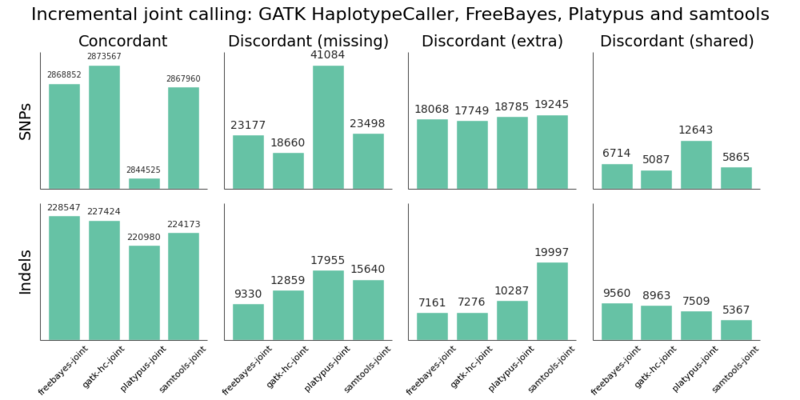 I have encountered a few people that did not considered using GATK alternatives because they interpreted from this post that samtools, playtypus and freebayes cannot do joint variant calling (i.e. standard stuff – non incremental) without tweaking with extra code. Could you just leave a small statement here that joint calling is perfectly possible if you have access to all bams and are willing to do it all again? Tiago — sorry about the confusion, I tried to clarify the difference between joint (calling independently into gVCF and combine) versus batch (call all samples together) in the terminology. You’re exactly right that all of the alternative callers will call in batches and can do quite large batch sizes now, so a custom implementation is not required for many cases. If this is confusing, it might also be worth leaving a note on the updated post at bcb.io: http://bcb.io/2014/10/07/joint-calling/ I’d like to revisit this with recent callers in a more up to date post as well and will try to make this more clear. Thanks for the heads up.